Calculate income, taxes, and more with these job flash cards. 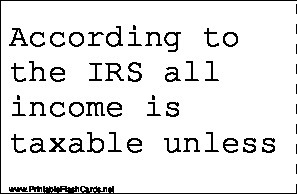 According to the IRS all income is taxable unless it is specifically excluded. What is the Doctrine of Constructive Receipt? that cash based taxpayers be taxed on income when it becomes available, regardless of whether it is actually in their physical possession. But the funds must be available without substantial limitations. 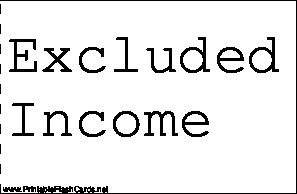 When is income considered to have not been constructively received? if a taxpayer declines it, as in the case of a prize or an award or if there are significant restrictions on the income or if the income is not accessible to the taxpayer. Under claim of right doctrine... income received without restriction must be reported in the tax year received, even if there is a possibility it may have to be repaid in a later year. When does the taxpayer have to report income that had to be repaid? the repayment is deductible in the year repaid. As a result the taxpayer is not required to amend his reported gross income for the earlier year. What is the tax rate for Social Security and Medicare? 15.3% up to $113,700 of a taxpayers combined earned income. what is the rate of SS and Medicare once earned income exceeds $113,700? a rate of 2.9% representing only the Medicare portion applies to the excess earnings. There is no cap to the 2.9% tax. Form 8919 Uncollected Social Security and Medicare Taxes on Wages Form that is filed by employees if their employer fails to withhold ss and Medicare taxes. When does an employee have to recognize an advance wages, commissions or other earnings? the year it was constructively received regardless of whether he has earned the income. What are supplemental wages? compensation that is paid to an employee in addition to his regular pay.